30.35 meters @ 1.92 g/t Au and 62.1 g/t Ag Ixtaca North Zone? 13.60 meters @ 3.62 g/t Au and 83.2 g/t Ag Ixtaca North Zone? Including 4.00 meters @ 10.24 g/t Au and 215.8 g/t Ag Ixtaca North Zone? 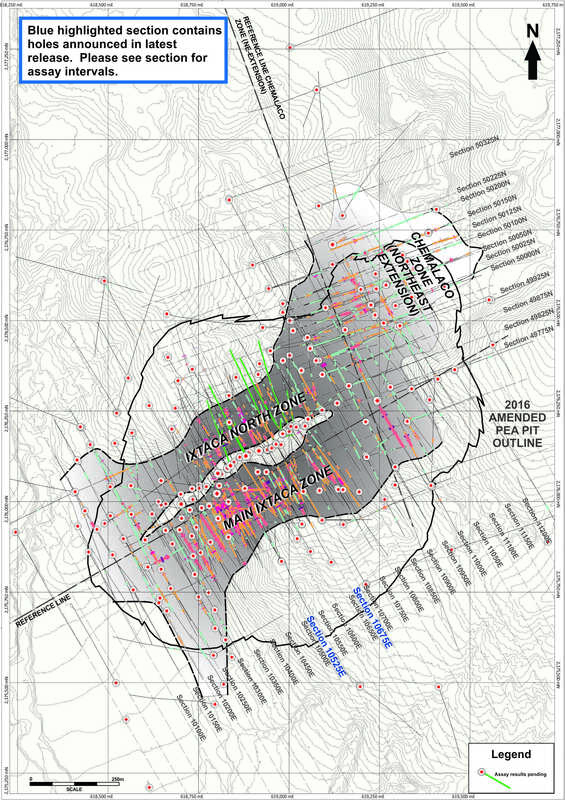 0.50 meters @ 5.97 g/t Au and 617.0 g/t Ag New Vein Zone? 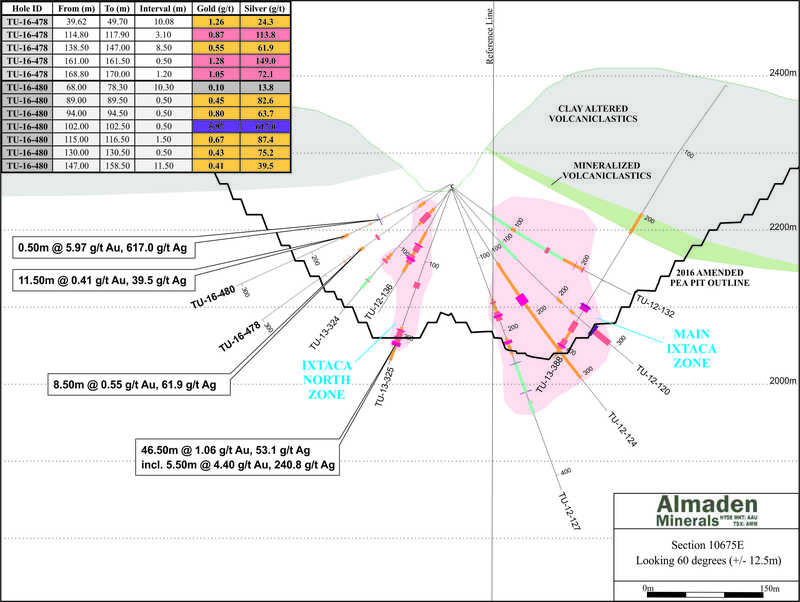 11.50 meters @ 0.41 g/t Au and 39.5 g/t Ag New Vein Zone? 2.00 meters @ 1.55 g/t Au and 30.4 g/t Ag Ixtaca North Zone? Including 0.70 meters @ 1.11 g/t Au and 148.0 g/t Ag Ixtaca North Zone? discovered in 2010 beneath a large area of largely barren clay alteration which has been confirmed subsequently to represent the upper portions of a gold and silver bearing epithermal vein system. 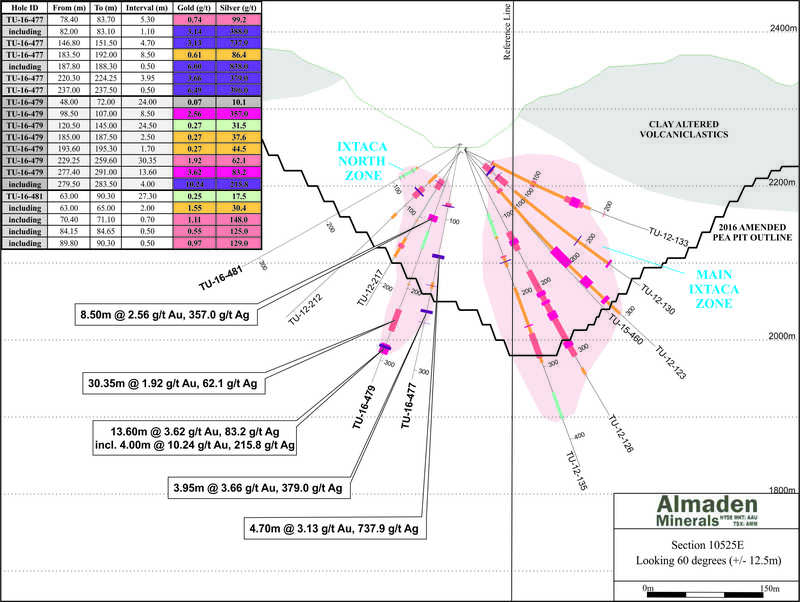 Since the discovery Almaden has focussed its efforts on the development of the Ixtaca Zone, however today's results clearly show the potential for additional mineralisation, not only proximal to the deposit, but more broadly project wide beneath the high level clay alteration. J.D. Poliquin, chairman of Almaden stated, "Today's results once again show the presence of the high grade veins on the Tuligtic project. While we are now focussed on developing the Ixtaca deposit into a significant precious metals producer in Mexico, and are currently busy with engineering work and studies towards producing a PFS, this exploration drilling demonstrates additional resource potential both laterally and, because we are at the top of a fully preserved epithermal system, future exploration drilling will also test for feeder veins beneath the Ixtaca sheeted vein zone." Almaden Minerals Ltd. is a well-financed company which owns 100% of the Tuligtic project in Puebla State, Mexico, subject to a 2.0% NSR royalty held by Almadex Minerals Limited. Tuligtic covers the Ixtaca Gold-Silver Deposit, which was discovered by Almaden in 2010.